The booming German automation sector was reflected in a record-breaking SPS IPC Drives show in Nuremberg at the end of November. We look at some of the event’s highlights. By the time the turnstiles finished turning at the 2017 SPS IPC Drives automation fair at the end of November, more than 70,000 visitors had passed through for the first time ever. The total of 70,264 represented a 9% increase on the previous record SPS event in 2015. The number of exhibitors in 2017 totalled 1,675 – a slight rise on the 2015 figure – with a third of them coming from outside Germany. The show, held in Nuremberg at the end of each year, is a barometer for the state of the German manufacturing sector, which is experiencing a boom at the moment. The PMI indicator for German manufacturing activity hit an all-time high in December, surpassing the previous highest value, recorded in February 2011. Output, new orders, exports and jobs creation have all been at or near record highs in recent months. The flipside of this success is that there is that supply chains are coming under strain, and delays in deliveries by suppliers are the worst on record. Raw material prices are also climbing sharply. The SPS show expanded into a 16th hall for the 2017 event and the total floorspace occupied by exhibitors amounted to 130,000m2 –­ another record. For the first time, there was a hall dedicated to the topic of software and IT in manufacturing, with exhibitors such as Microsoft and SAP. The worlds of automation and IT are becoming increasingly intertwined, and this was reflected in the widespread presence of industrial Web services and cloud activities at the SPS show – as well as concerns over cybersecurity. 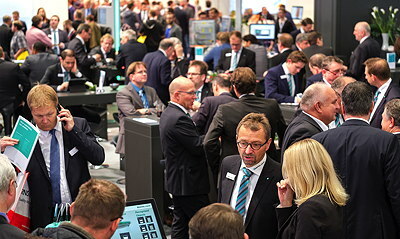 In addition to the continuing promotion of Industry 4.0, an emerging theme at the show was the use of TSN (Time-Sensitive Networking), with increasing numbers of suppliers nailing their colours to the TSN mast. Visitors to Bauer Gear Motor’s stand could view an IP68-protected motor operating submerged in a tank of water. The company was also highlighting its expanded HiflexDrive range of permanent magnet motors, which now includes aseptic and stainless-steel options down to 80Nm. The motors (shown below) can deliver constant speed, independent of load or voltage, and can produce energy savings of up to 40% under partial loads. Baumüller announced a range of precision servomotors with low detent torque and high control accuracy, aimed at applications requiring particularly smooth operation. The DSH1 motors come in frame sizes 45–100, have a top speed of 6,000 rpm, and have outputs of up to 8.2kW (in self-cooling versions). Baumüller also has a multi-axis controller consisting of up to six independently controllable axes that users can combine freely to deliver the right power for each axis. The b maXX 5800 controller needs only one fieldbus connection for all of the axes and uses a single cable that combines signals and power, thus simplifying wiring. Bonfiglioli launched a range of compact IP66 plug-and-play inverters for 230V single-phase and 400V three-phase applications, in three sizes from 0.4–18.5kW. The S2U inverters incorporate: a 32-bit processor; advanced IGBT power switching; PID and PLC functions; EMC filters; slip and torque compensation; a Modbus port; an emergency stop function; a braking chopper; and a fire mode for fan applications. They have a carrier frequency of 1–16kHz, which changes automatically with temperature. Bosch Rexroth had a new version of its MS2N high-torque synchronous servomotor with an integrated SafeMotion encoder which complies with SIL 3 / PL e, and eliminates the need for extra safety components. The MS2E motors can be used in single-cable installations that comply with Atex device group II, category 3G/3D, zones 2 and 22. CG Drives & Automation presented a compact new Emotron inverter in ratings up to 200kW, that can be wall-mounted. The 400V drive is available in IP20/21 or IP54 versions, with the latter eliminating the need for enclosures. Danfoss was promoting an improved version of its VLT AutomationDrive, available in a new generation of compact enclosures and with a wider operating temperature range (from –25 to +50°C, without derating). The drives offer hardware and software enhancements, while a built-in motion controller can be used to perform precision positioning or synchronisation with asynchronous or PM motors, with or without an encoder. Safe Torque Off is standard and other safety functions can be added via option boards. The Taiwanese manufacturer Delta unveiled a new range of VSDs which, it claims, are up to 40% smaller than their rivals. 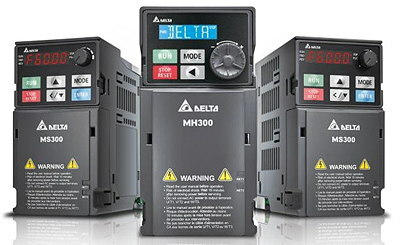 There are three versions of the M300 drives: the MH300, for advanced control of up to eight motors; the general-purpose MS300; and the low-cost ME300. The drives (below) provide open- or closed-loop control of induction or permanent magnet motors up to 22kW and 1.5kHz. They offer: rapid deceleration; a built-in PLC; EtherNet/IP communications; STO; USB ports; brake choppers; and slots for communications cards. Delta Line launched a 15W flat, eight-pole brushless DC motor under its Fulling brand, that is 32mm in diameter and 17.9mm long. The 32BLW offers smooth operation at low speeds, as well as the ability to operate at speeds above 5,000 rpm. Dunkermotoren is now offering a version of its BG95 integrated brushless DC motor with a built-in EtherCat interface. The compact motor, with an output of up to 2.6kW, operates from 24–60V DC supplies. It supports the Can-over-EtherCat protocol and is available with planetary or right-angle gearboxes with torque ratings up to 160Nm. Invertek was previewing a new version of its Optistick parameter copying device which can be used to create Bluetooth-enabled drives by plugging it into the front of the drive. The device allows real-time wireless monitoring of the drive on a smartphone, tablet or PC. Invertek is also replacing its long-standing OLED drive displays by TFT versions with twice the resolution. The Welsh drives-maker, which grew by 25% in the last financial year and has been taking record numbers of orders recently, also announced several enhancements to its drives range, including a new size for its high-performance Optidrive P2 range, more powerful IP66 drives, and an extension of its ratings up to 250kW by the end of 2018. Kollmorgen is now offering its S700 servo controllers with a single-cable connection to Hiperface DSL encoders or its own SFD digital resolvers. It says that this will help to save space, cut costs, boost machine performance, and achieve faster positioning speeds because less cable needs to be moved. The S700 controls are aimed at complex drive tasks and include cogging compensation. Leroy-Somer (now part of Nidec) was demonstrating a new integrated drive for its IMfinity induction motors from 0.25–7.5kW. The modular Commander ID300 drive incorporates an on-board PLC, fieldbus communications, safety functions to SIL 3 / PL e, and preset configurations such as pump pressure regulation. The all-in-one drives are available with optional brakes and helical gearboxes. Leroy was also previewing a range of Atex motors based on the IMfinity asynchronous machines. Covering the power range 0.75–200/400kW, the energy-saving motors will be suitable for use in zones 1 and 2, as well as 21 and 22. The German drives-maker LTI Motion has added two sizes to its SystemOne CM scalable, multi-axis servo system, which now covers ratings up to 100kW. Its largest axis controller has a nominal current rating of 210A. LTi says that the system’s highly integrated electronics results in savings in space and installation work compared to other designs. Maxon motor announced a 30mm-diameter brushless DC motor which offers high dynamics and low cogging torque, and can deliver up to 110mNm at 75W. The EC-I 30 motor is available in two lengths, each in standard or high-torque versions. Nord Drivesystems launched a series of field distribution systems for networked, multi-axis logistics facilities. The Nordac Link inverters and motor starters use coded plug-in connectors for power, communications and sensors, to help achieve fast, safe commissioning. Built-in maintenance and direction switches simplify servicing. The size 2 inverters are suitable for motors rated up to 7.5kW. One of Siemens’ many product announcements at SPS was a variant on its Simotics SD LV motors with a particularly low start-up current, thus increasing the motor’s service life, reducing torque shocks, and enhancing grid stability by reducing loads if the supply voltage dips. 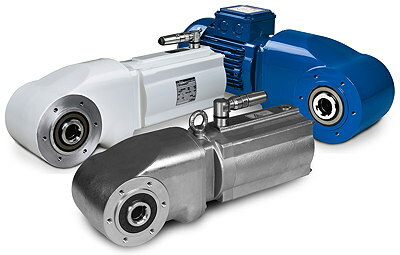 The Simotics SD Add motors are available in IE3 and IE4 efficiency versions. Siemens’ Simotics S-1FL6 low-inertia servomotors are now available with an extra single-turn absolute encoder with a resolution of up 21 bits, for enhanced positioning accuracy. The extra encoder eliminates the need for advance referencing, and can be used to generate “virtual” multi-turn encoder values, accelerating set-ups and reducing start-up times. Siemens has also extended its Sinamics S120 booksize motor modules (below), adding 14, 45 and 60A versions to the previous 3–30A range. The 45 and 60A variants are 33% narrower than previous modules, and some versions are available with double or triple overload capabilities. Another S120 development is new firmware (v 4.8) that allows the converters to control Simotics synchronous reluctance motors precisely down to a complete standstill without needing a position sensor. Any risk of the motor stalling if the load jumps is eliminated. Siemens has also extended its Sinamics G120 converter range to include a new frame size (the FSG) covering 380–480V and 500–690V. The compact PM240-2 power modules now span ratings up to 250kW, and the new frame size supports cable lengths up to 450m without extra options. For variants up to 132kW, push-through heatsinks allow most of the heat loss to dissipate outside the control cabinet. 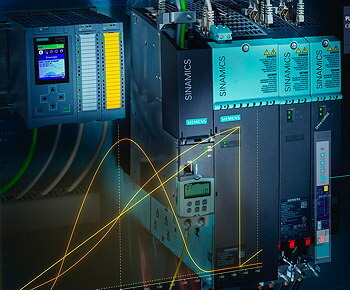 Finally, Siemens is offering a plug-and-play I/O extension module for its smallest converter, the Sinamics V20, that adds two extra digital and analogue inputs and outputs. Sigmatek has added a stepper motor output module to its S-Dias Motion family, capable of controlling two-phase steppers up to 50V DC and delivering continuous currents up to 5A in full- and half-step modes. The ST 151 module supports microstepping with 64 microsteps per full step. WEG has expanded its WG20 family of geared motors, taking their top torque rating from 1.55kNm to 5kNm. New helical, parallel-shaft and helical-bevel gearboxes have been developed and these can be combined with WEG modular motors from 120W to 30kW, and efficiency ratings up to IE4. The geared motors (below) have standardised mounting dimensions, allowing easy exchange worldwide. WEG has also extended its W60 family of 2.3–13.8kV induction motors to include frame sizes up to IEC 1000 and ratings up to 16MW. The compact, robust motors are claimed to need up to 50% less space than rival machines. They are suitable for high-speed operation, and are said to exhibit low levels of noise and vibration. Wittenstein cyber motor announced a version of its simco drive servo controller with a Sercos III interface. The controllers are aimed at high-performance applications with electronically commutated servomotors from 12–60V DC and 5kW peak power. Yaskawa has expanded the power ratings of its GA700 drives up to 355kW, and introduced seven new models. User manuals for the drives are now available as an app. A second app can be used to manage the drives, including setting and monitoring parameters. Yaskawa has also added new components and functions to its Sigma-7 servo system, including direct-drive motors with 24-bit encoders and a torque range of 1.3–240Nm, which eliminate the need for gears, saving space and boosting performance. There is also a servo amplifier with a built-in IEC 61131-3-compliant motion controller, as well as a twin-axis version said to reduce cabinet space by up to 16%. In addition, there are new 400V versions covering the power ranges 6–7.5kW and 11–15kW. Beckhoff has incorporated electronics overcurrent protection into 19 of its EtherCat I/O terminals to protect 24V DC system components. The EL922x terminals are said to save costs and space in control cabinets compared to existing protection devices, without needing to rely on an inflexible standalone system. The terminals include one- and two-channel versions for current loads up to 10A. 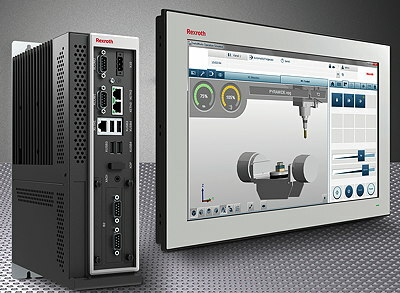 Bosch Rexroth was demonstrating a scalable industrial PC platform (below) that includes the PR range of box PCs, the DR series of multi-touch displays from 12–21 inches, and the VR panel PCs which combine the first two components and are aimed at HMI applications. A choice of CPUs is available, and Rexroth is guaranteeing that the hardware will be available until 2027, at least – in the last five years as spare parts. B&R Automation’s X90 modular control and I/O system can now be equipped with condition-monitoring functions, allowing problems to be detected and corrected before they cause failures. The functions help to determine which components – such as belts, gears and motors – need maintenance, and when. The German automation specialist GP Systems unveiled a fast, modular, redundant PLC for high-availability and mission-critical applications. The Regul R500 PLC provides redundancy for every component (CPU, I/O modules and power supplies) and can switch from the main to back-up CPU in 5ms. It has a minimum task cycle of 1ms and can operate by itself or as part of a distributed control system. Kontron unveiled a technology that allows remote visualisation on HMIs up to 100m from a control computer. The WideLink technology operates without time lags or quality losses via a standard Cat-6 Ethernet cable. It can carry digital display signals, touch interface feedback, as well as USB and audio signals. It does not use the PC’s CPU, memory or operating system. Kontron was demonstrating the WideLink technology with a new high-performance industrial computer in the COM Express form factor which can be used in controls. The KBox C-102 PC has been developed for use as an intelligent gateway for data-intensive IoT edge applications. Mitsubishi Electric announced a set of CPU modules for its Melsec iQ-R series PLCs, including a CNC CPU and a robot control CPU. The modules provide control capabilities with reduced I/O processing times. Direct integration with the PLC, along with SIL2 certification, help to reduce cycle times and to guarantee performance levels. Murrelektronik presented a new generation of compact, low-cost control cabinet modules for integrating signals into control systems. The 19mm-wide MASI20 modules are optimised for use in 120mm-deep terminal boxes. There are 28 push-in terminals on the front. Phoenix Contact has added eight-channel IO-Link boxes to its modular Axioline I/O system, allowing an IO-Link master to be set up as a modular I/O station and for distributed signals to be generated or received (including analogue signals via an analogue converter). The boxes can be connected to an IO-Link master using a single, unshielded sensor/actuator cable. Siemens has extended its IP65-protected portfolio with the Simatic HMI TP1200 Comfort Panel Pro 12-inch HMI, and the Simatic IPC477E Pro panel PC, with a choice of 15, 19 or 22-inch displays. The new arrivals are aimed at high-end applications. There are new 24V single-phase power supplies for Siemens’ Simatic ET 200SP distributed I/O system. The supplies have rated currents of 5A or 10A, and a current monitor that can be used to optimise energy management. Siemens also announced a free Web editor for its Logo! 8 logic module (below) which allows users to define and design their own Web pages for visualising and controlling their Logo! systems on a smartphone, tablet or PC. Sigmatek was showing a wireless mobile control panel which has a 10.1-inch multi-touch display and is equipped with safety functions, including an illuminated emergency stop. The 1.5kg HGW 1033 panel supports OPC-UA communication and incorporates a USB port. Safety data is transmitted via a standard WLAN using the black channel principle. Sigmatek has also added widescreen variants to its ETT family of multi-touch operating panels, covering five sizes from 1.1–21.5 inches. Vipa Controls has added new modules and functions to the Micro PLC that it launched at the 2016 SPS show. The modules include two four-output analogue modules, a four-input analogue module and a digital output module with eight relay outputs. A firmware update has added a Web server to the PLC, which now supports Profinet. Vipa also announced two series of IP66-protected panels in 4.3, 7 or 10-inch versions. The cloudPanel series (below) is aimed at Web and visualisation applications. 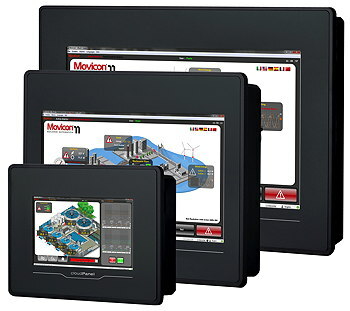 The smartPanel series is targeting small-to-mid-sized applications and comes with Movicon 11 software. Wago revealed several enhancements to existing products including an upgrade that transforms its PFC100 and PFC200 controllers into IoT controllers that transmit data from the field to the cloud, where it can be analysed. The upgrade consists of a firmware update and programming an IEC application with a library. Wago also announced an upcoming upgrade for the PFC200 controller (due in May) that will have a faster CPU, and more RAM and flash memory. The e!Cockpit software will also be upgraded to offer a Python interface that will allow applications to be loaded automatically to the controller. Wago is also expanding its XTR portfolio by adding 12 new I/O modules for applications subject to extreme temperatures, high levels of vibration, impulse voltages and/or EMI. The modules include analogue and digital I/O and Can communications. Weidmüller has combined three protocols – EtherCat, Ethernet/IP and Profinet – into a new I/O module for its u-remote system. It says the modules will cut costs by reducing the number of variants that users need to stock. The IP67-protected, 60mm-wide modules can be installed anywhere without needing much space. ABB announced a range of contactors with turn-off times of less than 30ms, which react quickly to dangerous faults and allow distances between moving machine parts to be reduced. The AFS contactors (below), in ratings up to 45kW, have a fixed front auxiliary block with two NO and two NC contacts in a yellow colour. New from Balluff are a transponder-coded safety sensor and safety interlock for protecting guard doors and flaps where contamination may be present. High coding levels ensure tamper protection, and the devices can be used up to SIL 3 / PL e. The BID R03K safety sensor has a long operating distance, while the BID Z01K interlock has latching forces of 25 or 50N. The Italian manufacturer Datalogic announced the first model in a family of a safe 2D scanning devices for static (machine and robot protection) and dynamic (AGV and forklift) applications in harsh environments. Users of the Laser Sentinel devices will be able to configure dozens of different area sets, activated depending on position, speed and movement. 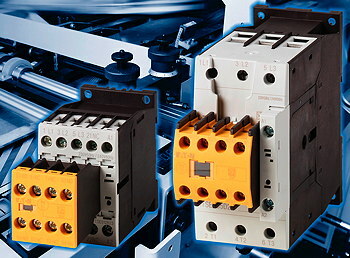 Eaton has developed safety versions of its DILM and DILA contactors (below). The new DILMS, which covers the range 7–150A in four sizes, has yellow-coloured, front-mounted, non-detachable auxiliary contact blocks. It does not allow manual changes to the switch position. The new tamper-resistant DILAS contactor is available in three versions covering both European and North American power supplies. Harting unveiled a surge protection module for electronic components that fits inside a Han-Modular connector, simplifying installation. It uses protective elements including gas arrestors, suppressor diodes and resistors. If an overvoltage occurs, there is a coordinated discharge. Harting says it will reduce faults and increase uptime. Ifm electronic has come up with a LED-based light tower whose colours, flash rates and siren sounds are configured via IO-Link, thus avoiding the need to screw modules of different colours together, and reducing stock-holding. A patented technology ensures a high contrast between the LED lights and the environment, while the absence of exposed metal parts allows use in the food industry. The cable-maker Lapp has introduced a pair of low-capacitance cables that allow longer transmission distances in servo applications. The Ölflex Servo 7TCE cable has a sheath made of an elastomer that allows installation lengths about 40% longer than standard cables. The Ölflex Servo 728 CY cable is designed to extend transmission distances in analogue and absolute rotary encoder applications. The Italian manufacturer Lovato had several new arrivals on its stand including: switch disconnectors rated up to 315A (the previous highest rating was 160A); an range of expandable single- and three-phase energy meters with enhanced communications (USB, RS-232, RS-485, Modbus, M-Bus or Ethernet); a family of motor starters in ratings from 0.37­–160kW, which are suitable for IE3 motors; and a series of motor protection circuit-breakers, including 45mm-wide pushbutton types up to 40A, and rotary control types up to 100A. Phoenix Contact launched a cloud application for recording and analysing safety-related data. Status information on standard and safety functions are transmitted continuously via Profinet to the Proficloud, where it is evaluated. It can be used to determine interdependencies between safety and process parameters and to discern patterns, allowing machine designs and work sequences to be optimised. Phoenix also announced IO-Link versions of its Contactron range of hybrid motor starters, allowing consistent communications between field and control levels for data such as diagnostic messages and motor current values. The space-saving starters can be fitted into decentralised control boxes. 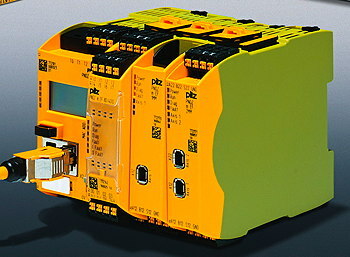 There were several new arrivals on the Pilz stand, including expansion modules that allow up to 16 of its PNOZmulti 2 configurable controllers (below) to be daisy-chained via the SafetyNet p safe real-time Ethernet system. The PNOZ m EF SafetyNet modules provide safe connections and data transfer between the controllers. Pilz is also offering two new drive-monitoring safety functions for the PNOZ m EF 1MM and 2MM motion-monitoring modules of its PNOZmulti 2 controllers: safely limited acceleration (SLA-M); and safe acceleration (SAR-M). The SLA-M function prevents drives from exceeding a defined acceleration limit, while the SAR-M ensures that safely-monitored acceleration stays within defined limits. Pilz unveiled a new version of its SafetyEye camera-based safety system, first seen a decade ago, with a live video server that allows warning and detection zones to be displayed remotely. Finally, Pilz has a new, long-range version of its PSENvip 2 camera-based protection system for press brakes, with a protection range of up to 18m. Rittal has extended its high-efficiency Blue e+ range of enclosure cooling systems down to 1.6kW (the previous lowest rating was 2kW), claiming the system is 75% more efficient than previous cooling systems. There is also a new graphical touchscreen control panel that shows all key information at a glance. Rittal has also introduced an IoT interface that can connect the Blue e+ systems to almost any monitoring or energy management system via OPC-UA, Profinet, SNMP, Modbus or CanOpen. The interface, which can be mounted on the cooling system or on a DIN rail, will pave the way for applications such as energy data management and optimising maintenance, thus reducing running costs. Schmersal was one of many companies at SPS promoting its cloud capabilities. Its Safety to Cloud system allows all of its solenoid interlocks and safety sensors fitted with an SD (serial diagnostics) interface, as well as some of its safety light barriers, to transfer data to the cloud via the PSC1 safety controller or an SD gateway in conjunction with an Edge gateway, which forwards the data in the OPC UA format. This capability will give users diagnostics options, including switching cycles, safety status information, tolerance warnings, distance warnings and more. Schmersal also had new families of safety light barriers and grids with 14mm resolution. 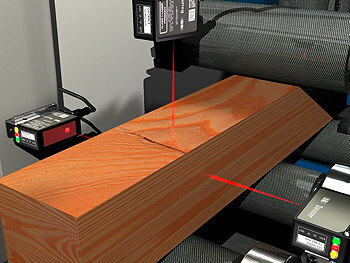 The SLC/SLG 240 COM devices have built-in beam concealers for fixed and stationary objects in protected areas, allowing workpieces to be fed in or transport belts to be positioned, without triggering a stop. A setup guide which displays signal values while the safety system is running, avoids the need to switch to a set-up mode if, for example, the sensors get dirty. A new generation of position switches from Schmersal can be used either as complete devices or as parts of a modular system. The IP66 or IP67 protected PS Type 1 switches are designed to detect positions and monitor moving parts in accordance with ISO 14119, as we as for lateral or pivotable protection equipment. The modular design cuts stocking costs. 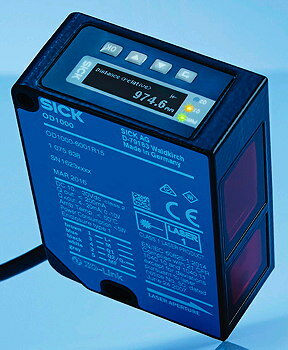 Sick claims to be offering the first safety laser scanner to support CIP Safety over Ethernet/IP. The microScan3 Ethernet/IP scanner is compatible with all common CIP Safety controllers. There is also a Profinet version that allows safe bus communication via ProfiSafe. Both versions protect multiple hazardous areas and up to four protective fields. The scanners can be configured via the network as well as protecting against unauthorised changes to their configuration. 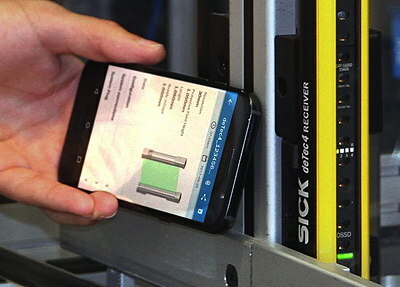 Sick is also equipping all of its deTec4 safety light curtains with NFC (near-field communications) tags, allowing data from them to be read via an app for quick, on-site diagnostics. Users simply hold a smartphone near the light curtain to obtain the data (as shown below). The curtains do not need to be powered, so can be checked while in storage. TE Connectivity has developed M12 connectors for servomotors that are about 20% smaller than M15 versions. The connectors have four contacts for signals and communications as well as four 630V power connections. A fast locking system is three times faster than screw connections. Bosch Rexroth announced a range of self-cooled, iron-core linear motors with high force densities, low cogging forces and highly dynamic capabilities, thus offering an alternative to ballscrews combined with servomotors. The ML3 motors have fewer components, low wear and can achieve high speeds, thus boosting productivity. Matrix International launched a range of precision, low-backlash servomotor brakes with static holding capabilities for load positioning, as well as consistent dynamic torque for emergency-stop applications. Through flux optimisation, the SMB brakes are said to deliver a good force-to-size ratio. Schunk is now offering its ELP 24V linear modules with an optional electrically activated holding brake which will offer an alternative to pneumatic systems. If the power fails, the brake holds the linear module in place and prevents vertical axes from falling. The brake –available with holding forces of 70N or 180N – can execute the STO function and the module can be stopped at full speed. Wittenstein has upgraded the well-established SP+ and TP+ low-backlash planetary gearboxes in its alpha Advanced Line series (below), to deliver up to 20% more torque, almost 30% higher top speeds, and 6dB less noise, in the same compact housing. An increased power density makes better use of motor capacities and allows more dynamic processes, resulting in shorter cycle times and improved productivity. A patented mounting ring saves the time needed to pick screws and avoids mounting errors. Yaskawa has launched a compact, six-axis robot with a 25kg payload capacity, which it claims is the fastest in its class. The Motoman GP25 robot is aimed at high-speed joining, packaging and handling applications. It is IP67-protected, allowing use in harsh environments. The matching Motoman YRC1000 controller includes a handheld programming pendant with a touchscreen that can show a 3D simulation of the arm moving and the limits of the safe workspace. At SPS, ABB launched a system for monitoring energy use and overloads in the final circuit of electrical installations. The retrofittable CMS-700 system takes measurements from protection devices in distribution boards. It can analyse current flows and other data in up to 96 circuits and display this online using a built-in Web server, allowing users to identify individual circuits and neutralise power surges and other risks. Balluff unveiled a pair of industrial cameras: the SmartCamera Color, which analyses colour shades, brightness and saturation, allowing early detection of production errors; and the SmartCamera Ident, which is designed for traceability applications and includes tools for code or text reading and identification. Built-in IO-Link masters allow other devices to be connected. Also new from Balluff is a linear magnetic encoder system that can measure lengths up to 48m with an accuracy of up to ±20µm and a repeat accuracy of <1µm. The BM-S1G SIL2 system is designed for safety applications up to SIL 2 / PL d. It has both an analogue and a safe absolute SSI or BiSS-C interface. An optional configuration tool adds extra functions such as condition monitoring. Baumer announced laser point and line distance sensors that allow repeatable measurements in the sub-µm range and can be used to measure components and to position objects or grippers. The OM70 sensors (below) are not affected by variations in temperature or light levels. Variants are available that check the dimensional accuracy of objects. Another new arrival from Baumer is a range of 58mm Ethernet rotary encoders with an installation depth of 47mm – claimed to be the smallest in their class. The EAL580 EtherCat encoders have 62.5µs cycle times and are certified to CanOpen 4.0.2. An IP67 button allows values to be preset on the device. Bogen is offering absolute magnetic encoders in either linear (100mm–3m, <1µm resolution) or rotary (100m–1m diameter, up to 24-bit resolution) versions. The 28mm-long, 16mm-wide AKS17 encoders can be used where optical encoders would be too expensive. They are 3.4 or 6.6mm high and have BiSS-C or SSI outputs, as well as producing incremental quadrature signals. Datalogic has released what it claims is the smallest 2D imager available. The IP65-protected Matrix 120 is available in several versions, including a standard-resolution WVGA model, a high-resolution 1.2MP version, a wide-angle version for proximity reading, a 1D code model, and a polarised model for use with reflective surfaces. Datalogic has also added a new member to its family of industrial scanners. The PowerScan 9100 linear imager uses a green scanning line, said to deliver the same definition as a laser scanner with the benefits of a linear imager, resulting in good 1D decoding. As well as standard RS-232 and USB ports, Ethernet is an option. Delta has a high-speed machine vision system that accepts inputs from up to eight cameras for applications such as quality inspection, size and angle measurements, counting, identification, pattern searches, colour checking, bar and QR code reading, coordinate searching, and more. The DMV2000 system takes 15ms for a 0.3-Mpixel full area inspection, and can produce 509 frames/s at 12MB resolution, or 295 fps at 2MB resolution. Harting unveiled a range of current sensors that can be used in frequency converters to measure current consumption by motors. The HCME sensors have rectangular cores and are designed for installation on busbars. They are claimed to offer a precision that, in many installations, can only be achieved by using more costly compensating current transformers. There are seven models for currents up to 5.5kA and they can measure DC or AC from 0–50kHz. New from ifm electronic is an infrared temperature sensor whose analogue and switching outputs, and emissivity, can be set remotely via IO-Link. The TW21 uses a green pilot light that is visible even on red-hot surfaces in industries such as steel, plastics and glass. 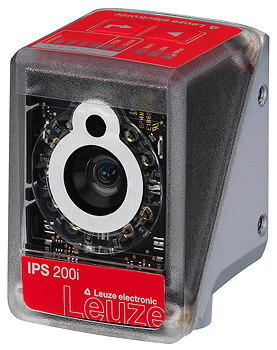 Leuze electronic claims to have produced the smallest camera-based sensor available for fine positioning applications in high-bay storage systems. The IPS 200i sensor (below) has built-in infrared LED lighting giving a working range of up to 600mm. Fast commissioning is possible using a Web-based configuration tool. Pepperl+Fuchs has added a new model to its easy-to-commission SmartRunner range of camera-based light section sensors which send a “good” or “bad” signal to their switching outputs. The new Matcher model detects the presence, completeness and position of objects using profile comparisons. It can store up to 32 learned profiles and be switched between them remotely. It can also detect shifts between taught positions of objects and their current positions. Sick had several new arrivals including a pair of displacement measurement sensors, based on a laser triangulation technology, that can be used to sort or check items and to measure dimensions, position and shape. The OD1000 version (below) has a sensing range of up to 1m, and is almost unaffected by the object’s surface. The OD5000 version is aimed at µm-precision measuring tasks on quick or rotating objects, and has a measuring frequency of up to 80kHz. Sick also has a new family of single- and multi-turn absolute encoders with IO-Link interfaces, allowing parameters such as resolution and counting direction to be adjusted remotely. The AHS36/AHM36 encoders offer a resolution of 14 bits (single-turn) or 26 bits (multi-turn). They incorporate intelligent diagnostics to gauge maintenance intervals for an entire system. Sick’s new PSS print detector combines pattern recognition with quality checking to verify the presence of printed images such as serial numbers, 2D codes and best-before dates. The detector can recognise images in poorly-lit conditions, on round surfaces, and at speeds of up to 4m/s. It can also check whether an image is too faint or incomplete. Siemens unveiled the first in a new generation of optical read devices said to offer improved reliability and faster reading (up to 100 reads per second) compared to the previous generation Simatic MV440. The new MV540 offers one-button configuration for network parameterisation and a choice of accessories including lenses with electronic focus, and ring-lights with configurable segments. Steute launched a wireless optical sensor as an alternative to electromechanical wireless position switches. The RF 96 LT sensor is an improved version of an earlier device with improved reaction times and switching frequencies (1kHz), and optimised energy consumption. There are two versions: one communicates wirelessly with Steute’s sWave receiver; the other can be integrated into its sWave.Net wireless network containing many other devices. 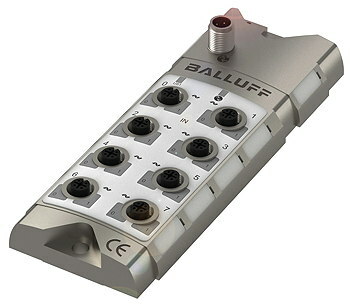 Balluff has developed an IP67-protected IO-Link hub (below) which passes up to eight analogue input signals to an IO-Link master as digital signals. This eliminates the need for special shielded or unshielded cables, distribution boxes, costly analogue interfaces and extra junction boxes. By switching from analogue to digital data, the process quality is also improved. Each port can be configured as an a current/voltage input, or for a Pt sensor or thermocouple. Various current/voltage interfaces can be mixed, and the resolution can be set from 10–16 bits. 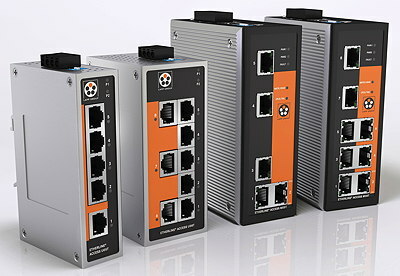 Belden announced several additions to its Hirschmann and Lumberg portfolios, including: the first device to combine field I/O and a PLC and to provide multi-protocol support with M12 L-coding (the Lumberg LioN-Power µDCU); the first I/O modules to support Profinet, EtherNet/IP and EtherCat in one device (Lumberg LioN-Power Universal 16DIO); and the first LioN-Power IO-Link I/O hub with 16 digital inputs, supporting IO-Link v1.1 and Class A ports, allowing connection to any IO-Link master. New from Hirschmann is a Layer 3 Ethernet backbone product in two variants: up to 80 1Gb/s modular ports; or eight 10G fixed ports. The Dragon Mach 4000/5000 devices has slots for up to 48 extra copper or fibre ports. Also from Hirschmann comes an access point with a WWAN (Wireless Wide Area Network) interface. HMS Industrial Networks announced a second generation of its Anybus .Net bridges which act as “translators”, sending and receiving data between factory networks and IT platforms using .Net as a framework. The original Profinet and Profibus bridges have been updated with new functions, and EtherCat and EtherNet/IP versions have been added. They allow .Net programmers to build PC programs that can exchange live data with a PLC for statistics, analysis or maintenance. HMS also has an IIoT gateway and remote access router aimed at machine-builders. The eWon Flex 205 will allow them to enable alarm notifications, to read machine data and to log it for analysis and predictive maintenance. The device also provides VPN remote access using eWon’s Talk2M remote connection service, and can be tailored to specific functions by adding extension cards. The cable-maker Lapp presented its first industrial Ethernet switches at SPS. There are four models in the Etherline Access managed and unmanaged switches (below), which have up to eight RJ-45 ports. If a network with 250 active components is interrupted, it takes just 20ms for communications to be restored. Lapp also announced a range of Cat 7 Profinet cables that can deliver 10Gb/s and operate at a frequency of 600MHz, even if they age or are damaged over time. There are versions with various sheath materials to make them flame-retardant, halogen-free and robust. Fixed cables are 8.1mm in diameter, while there are two 8.7mm-diameter flexible variants. 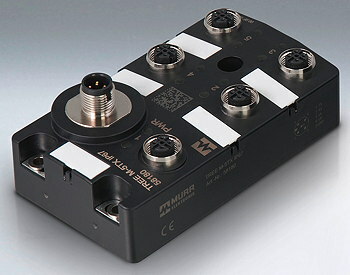 Murrelektronik has developed a range of 30mm-wide multi-function I/O modules that can be used for up to eight IO-Link sensors and actuators, or can be parameterised as traditional I/O. The encapsulated, metal-housed Solid67 modules are shock and vibration resistant and can be installed close to a process. They support either ProfiNet or EtherNet/IP at the flick of a switch, reducing stock-holding, and have built-in diagnostics functions. Their L-coded M12 power lines can handle up to 16A. Murr also has a range of encapsulated, IP67 managed ProfiNet switches that can save cabinet space by being installed in the field. The Tree M switches (below) map network topologies automatically to detect if lines fail. They have built-in diagnostics and can spot gradually developing errors. They can also detect unknown or unauthorised devices on the network. Finally, Murr’s rugged Impact67 fieldbus module is now available for EtherNet/IP and has been certified by ODVA. Phoenix Contact was demonstrating a second generation of its Ethernet Port Adaptors (EPAs), which combine Bluetooth and WLAN transmission in an IP65 module. They allow Ethernet-compatible automation devices to communicate wirelessly with a control network in harsh environments. They can transmit protocols including Profinet, Modbus TCP and EtherNet/IP, as well as safety-related data. Phoenix has also updated the firmware of its Factory Line Switch 2200 and 2300 managed switches so they now support Profinet functions. Users no longer need to configure the device for Profinet because they come configured and ready to be integrated into engineering systems such as PC Worx and TIA Portal. Configuration and diagnostics can be performed from a controller. Procentec was demonstrating a device that connects redundant Profibus networks fibre optics. The ProfiHub F1 can link systems over distances of up to 5km. Procentec has also updated its Atlas system for monitoring and diagnosing industrial Ethernet networks. Siemens launched a new generation of compact, unmanaged industrial Ethernet switches that can be used to configure electrical and optical line and star topologies. 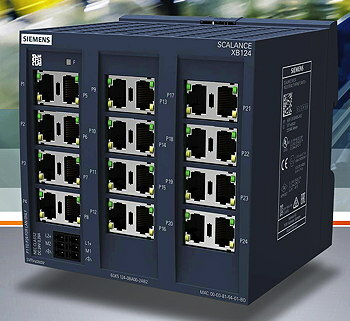 There are five variants of the Scalance XB-100 switches (below) with up to 24 RJ-45 ports as well as two ST/BFOC or two SC ports, allowing up to 5km to be bridged in multimode operation. They are available for 24V AC or DC operation with redundant power supplies. Siemens has also extended its portfolio of access points with models that support the IEEE 802.11ac Wave 2 WLAN standard. The Scalance W1788 access points are suitable for wireless applications with gigabit data rates. Built-in switches have two managed Ethernet gigabit ports. TE Connectivity is developing a mini I/O Cat 6A cable connector that is said to be quarter of the size of RJ-45 designs and can transmit data faster in applications such as motor feedback systems. TE also has an RJ-45 cable-to-cable connector that takes less than a minute to connect – half as long as rival products, according to the company. It is available in an IP67 version. Aucotec presented its cloud concept for the first time. It allows machines, plants and mobile systems to be planned without needing dedicated server hardware. The company is bringing out a series of apps for specific applications, the first two of which are for maintenance and mobile stocktaking, and for transferring data to Aucotec’s Engineering Base cooperative platform which can be used on any device. Eplan was showing several developments and enhancements, including a preview of a cloud-based implementation of its Cogineer software which generates schematics automatically. Based on Microsoft Azure, the cloud version provides secure, global data access and allows users to save, archive and version data, without any effort. Eplan was also demonstrating the bidirectional exchange of PLC data between its Electric P8 software and Mitsubishi Electric’s Melsoft iQ Works platform. The linking technology, based on AutomationML, allows data such as symbolic addresses to be exchanged in two directions. Rittal has added fluid cooling data to Eplan’s Data Portal, allowing users to plan cooling systems in an integrated manner with electrical schematics and 3D macros for control cabinet engineering. During 2017, the number of manufacturers represented in the Data Portal grew by 29% and it now has data on more than 780,000 devices. Recent additions include converters from Baumüller, inverters and RFI filters from Lenze, I/O modules from Turck, and 1,100 records for frequency inverters from Nord. Phoenix Contact is offering a cost-free engineering platform for tasks such as configuring, programming, diagnostics and visualisation of automation applications. The PC Worx Engineer platform has an “intuitive” interface which shows users only those functions and actions they need for the tasks at hand. Extra, paid-for functions, such as safety-related or visualisation components, can be added, allowing users to create customised versions of the software. Sick is offering its customers a customised service platform through which they can access information about the status of their machines and systems, and thus plan for maintenance, servicing and safety inspections. Its Digital Maintenance Manager has a Web front-end and mirrors the user’s production setting in a digital format. The software also facilitates the management of service documents. The latest version (v15) of Siemens’ TIA Portal engineering framework integrates Sinamics S120 and other drive families, allowing them to be configured, commissioned and diagnosed via the Portal. There is also a new wizard-guided safety acceptance test for Sinamics G drives. When used with new technology CPUs in the Simatics S7-1500 controller family, handling functions with 2D and 4D kinematics ­– such as gantries, delta pickers and Scara robots – can be programmed, simulated and commissioned in TIA Portal. There are also block libraries from Kuka and Yaskawa for programming robots. Other robot-makers, including Denso and Staubli, are planning to release similar libraries soon. The next SPS IPC Drives show will take place from 27–29 November, 2018, in Nuremberg.